Students in Samford University’s School of Health Professions will soon benefit from a new minority scholarship established in honor of legendary radio personality, business leader and philanthropist Shelley Stewart. The fund, created by friends, also honors the memory of Stewart’s late mother, Mattie C. Stewart. Intended to support efforts to increase racial diversity at Samford, the fund is designated for health professions students underrepresented in the student body who have demonstrated financial need. Students who have experienced significant socioeconomic or educational disadvantages may also be considered. “The School of Health Professions is called to serve and train the next generation of students to improve the disparity that exists in health care in regard to diversity,” said School of Health Professions Dean Alan P. Jung. “This scholarship will allow us to extend the reach of our school by providing opportunities for underrepresented minorities who can positively impact the health of individuals and communities,” he added. Stewart’s story is one of perseverance. At only five years old, he witnessed the death of his mother at the hands of his father. The years that followed were filled with violence, abuse and eventual homelessness. Despite his circumstances, Stewart remained passionate about education and he quickly earned success as a radio personality. In the 1960s, his radio show was a pivotal force in the civil rights movement. In 1967, in an unlikely business pursuit, Stewart, an African-American, cofounded an advertising firm with a white business man. The firm, known today as o2ideas, went on to become a nationally renowned advertising and public relations agency that often has Samford students in internships. In 2007, Stewart founded the Mattie C. Stewart Foundation to help reduce the dropout rate and increase the graduation rate through the development of innovative tools and resources for educators. Stewart has a long connection with Samford. In addition to being a frequent speaker on campus, Stewart and Samford President Andrew Westmoreland cofounded and lead Birmingham Kitchen Table, a project that brings diverse individuals together to discuss community-focused topics. 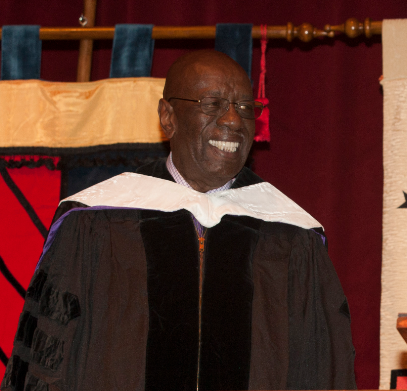 In 2013, he was named alumnus honoris causa, one of the university’s highest recognitions for non-graduates, for his role in the civil rights movement and his work in the community.